The spring housing market is starting to bloom, but before you jump in, it’s worth doing a detailed breakdown of what it actually costs to run a home. There’s more to your budget than property taxes and mortgage payments. And speaking of property taxes, don’t assume that what you see on realty websites is accurate. Home insurance may be higher than what you’re used to as well, especially if you have a bigger space on a bigger lot further away from fire and emergency services. Figures from InsurEye Inc. from 2012 show that Canadians pay an average of $840 annually for their home insurance, with B.C. having the highest rates, at $924 ) annually. According to Numbeo, the average cost of basic utilities in Canada for a small apartment is nearly $160 per month, while an Internet connection is close to $52. But owning a home means you’ll pay hundreds of dollars more a month on such things as water and waste removal, maintenance fees if your property is not a free hold, water heater retal, alarm system charge, etc. “If you’re purchasing an older home, there may be costs for things like updating the electrical panel,” Rai says. If you have to upgrade knob and tube electrical, be prepared for thousands of dollars in costs. Urea formaldehyde foam insulation, asbestos and any substantial structural issues will have to be addressed right away. If you’re in a home as opposed to a condo, you’ll need to take care of shovelling the driveway and salting the walks in the winter and cutting the grass in the summer. Do you own a sprinkler? Hoses? Shovels? A lawn mower? You’ll need to buy all those (which will all eventually need to be replaced) plus put money at different times of the year toward things like de-icing material and yard-waste bags. If you don’t have a storage shed for all that stuff, you’ll need to buy or build one. Some people opt to aerate and fertilize their lawn every spring, which adds up. If you don’t have any interest in caring for your lawn and garden, you’ll need to hire services. If you have a fireplace, you’ll have to budget for annual chimney sweeping. If you live in a rainy climate, you’ll need to have your gutters cleaned inside and out every year. 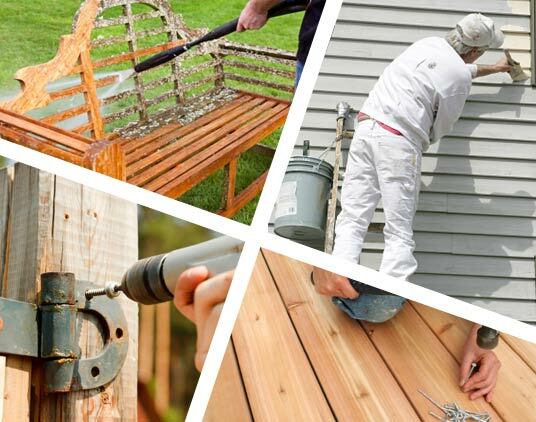 If you have a deck or patio, you may need to invest in a power washer as well as the time and materials to re-stain regularly. Then there are bigger-ticket items that renters never need to worry about: replacing or repairing major appliances, redoing the roof, repaving the driveway, painting the exterior, fixing the fence, getting a new hot-water heater, and so on. Another expense that comes up from time to time is junk removal. Unless you have a big vehicle and the inclination to drive to the transfer station to dump or recycle your old and unused crap yourself, you’ll need to hire someone to do it for you. Mandlecorn suggests setting a budget for things like furniture and décor “so you don’t get carried away”. “The last thing you want is to use your secured line of credit or credit cards to furnish your home,” she says. Financial experts also urge people to set money aside for an emergency fund so that when big expenses like the need for a new roof come up, they won’t be so much of a strain.